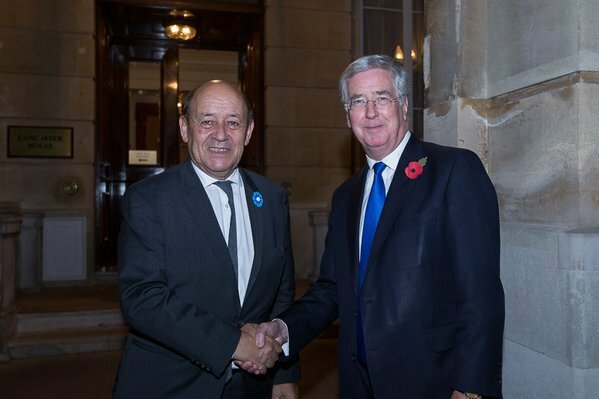 On the fifth anniversary of the Lancaster House Agreement, Defence Secretary Michael Fallon and French Minister for Defence Monsieur Le Drian reaffirm the defence relationship between their countries. UK-French defence cooperation is nothing new. For more than a century our Armed Forces have fought side by side. In 2016, we will commemorate the courage and sacrifice of all those who, one hundred years ago served alongside each other in defence of our countries during the Battle of the Somme. World War I claimed more than two million lives in our two countries alone. Since 1945 our two countries have dedicated a substantial proportion of our national wealth to defence, reflecting our responsibilities as permanent members of the United Nations Security Council, willing and able to deploy and sustain armed forces around the world. Since October 1995, as President Jacques Chirac and Prime Minister John Major set out in their Declaration when they met at Chequers, we have recognised the significant convergence of our vital interests. Together, both our defence budgets put together represent almost half of total defence expenditure of the EU Member States, and an even larger proportion of European defence research and development. We have achieved a great deal in the last five years. We have shown that France and the United Kingdom have powerful military capabilities and the political will to use them on the whole spectrum of crisis management missions. Our Armed Forces operated together against the Taliban in Afghanistan and off the Horn of Africa; they remain engaged side-by-side against ISIL, in the Mediterranean and in the EU training and advisory mission in Mali. Together, we are engaged in air-policing duties within NATO. The UK has provided strategic air transport and surveillance support to French operations in Mali and the Central African Republic. France supported the UK Tornado deployment to help the Nigerian Government in its fight against Boko Haram. French Atlantique Maritime Patrol Aircraft have operated from RAF Lossiemouth in Scotland. These successes encourage us further to deepen, broaden and sustain our cooperation under the Lancaster House agreements. Tomorrow is our ninth meeting in the last year, an unprecedented drumbeat of Ministerial engagement. Defence and security policy teams now engage on a range of issues from strategic and intelligence analysis, non-proliferation and nuclear policy to African security and NATO reform. Only a few weeks ago we jointly opened the first defence cyber conference in Paris. Since the Charlie Hebdo attacks we have been working together over the issue of military contribution to domestic security. We are committed to maintaining this momentum in 2016 and beyond.